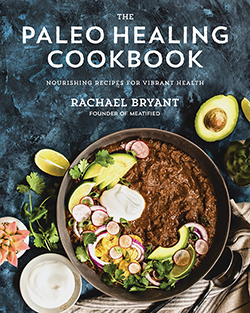 If you’ve had a copy of The Paleo Healing Cookbook since before it was even called that… then you’ve known and loved this recipe for my nightshade free sweet & tangy BBQ Sauce since 2015. For the rest of you lovely people, consider this my gift to you! My husband has always said that it was worth buying my cookbook for this recipe alone and… to be honest, he’s not wrong. This simple and utterly non-photogenic recipe for nightshade free BBQ sauce is probably the one that I’m most proud of, not just from the recipe development of my cookbook, but of all my time blogging and recipe testing. I’m not one to toot my own proverbial horn, but this recipe was beyond a labor of love. It was days of stinking up my kitchen-without-an-extractor-hood with vinegar, an endless array of empty pantry items and close to 30-something iterations before I finally had a BBQ sauce that made us all go: THIS IS THE ONE. So, this nightshade free BBQ sauce is kind of my kitchen baby. It’s got no nightshades or seed spices – when ketchup and mustard are usually the backbone of many a BBQ sauce! – and it’s totally AIP. But, most importantly, it looks, tastes and acts just like NORMAL BBQ sauce. Which means that unlike the more common AIP fruit based sauces, it works on the grill and under the broiler, not just as a last minute condiment you add to your plate. So you can use my nightshade free BBQ sauce for marinading and basting just like back in the days when BBQ sauce was actually convenient as well as delicious. It is thick, rich, tangy and sweet, but has a lovely hint of bite that balances that sweetness. It’s basically the perfect BBQ Sauce… and also the special diet equivalent of a damn unicorn. Years after I finally nailed this recipe, my nightshade free BBQ sauce has still has never failed me. “Normal” eaters can’t tell the difference between this gloriousness or the usual grocery store options & those of us who can’t tolerate nightshades or mustard high five each other on the way to getting second piles of ribs or shrimp skewers or chicken legs or pulled pork or…. you get the idea. At first glance, it may look like a lot of ingredients, but the recipe is so, so easy: just blend, then simmer aaaand you’re done. But that flavor balance from the layering of these ingredients is pure, alchemical kitchen gold. You’re gonna have to trust me on this. I usually make a double batch, since it keeps (almost) forever in the fridge. You won’t regret doing the same! Looking for a nightshade free bbq sauce that’s rich, sweet & tangy? This is it. This AIP BBQ Sauce from The Paleo Healing Cookbook looks, tastes & acts just like your old favorite recipe. I usually make a double batch, since it keeps in the fridge for weeks. BLEND: Add all ingredients except the bacon fat to a blender and process until smooth and combined, scraping down the sides a few times as needed. SIMMER: Pour the blended BBQ sauce mixture into a saucepan over medium heat, heating gently until the bbq sauce comes to a simmer. Add the bacon fat and stir until it melts and combines evenly with the bbq sauce. THICKEN: Reduce the heat so that the BBQ sauce simmers gently but doesn’t boil or splash and cook, stirring gently, until the sauce thickens and darkens to a rich, deep brown hue. 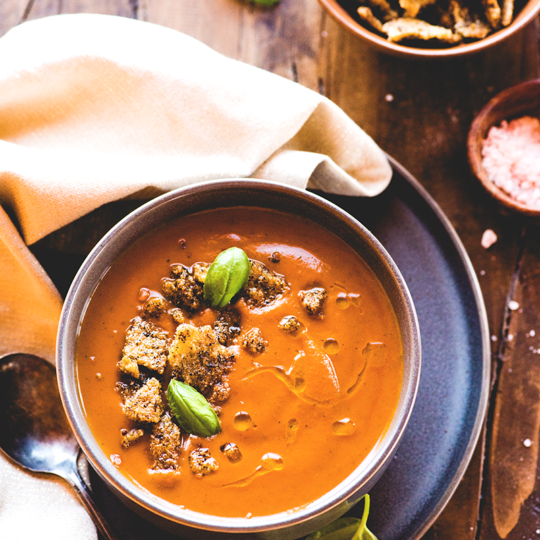 Don’t worry about the foam that you may see on the top of the sauce at the beginning – just keep stirring regularly and it will dissipate as the sauce cooks, reduces and thickens. If you like your BBQ sauce with a bit more tanginess, add additional apple cider vinegar, to taste, then cook for an additional 5 minutes at the end. STORE: Pour the finished nightshade free BBQ sauce carefully into jars to cool. You can keep the BBQsauce in the fridge for up to 2 months. You can use it straight from the fridge as a marinade, but you’ll want to gently reheat it to use on the side as the bacon fat will re-solidify when chilled. To make a coconut free of this nightshade free BBQ sauce, omit the coconut aminos and increase the fish sauce by 2 tablespoons / 30 ml and the balsamic vinegar by 1 tablespoon / 15 ml. You can also add 3 tablespoons of broth or water, if you like, to make up the liquid volume lost. I had ribs cooking in the oven low and slow (pastured pork of course) when I this recipe popped up in my email. Of course I had to try it. Was a bit concerned based on the ingredients. WOW is it good!! I usually take recipes and slightly alter to my tastes. Not this one!! I will have this in my fridge at all times, ready to baste on to some yummy chunk of meat! Thank you, thank you. I’m so happy to hear that you & your family are still enjoying it! I wonder if it’d be okay without the applesauce and ginger? XD We are a house full of food allergies. I’m not too worried about the ginger, but the applesauce I’m not sure what to replace with? Maybe pear? Honestly, I think you could just skip the applesauce and it will only make a tiny difference in the thickness of the sauce. The ginger is there for a smidge of background heat. Do you need to keep this AIP or just nightshade free? If it’s the latter, I’d add in a bit of ground black pepper for just a little kick. YAY!! This seriously made my day, I’m so happy to hear you enjoying this because I have definitely been where you were. I have to admit I chuckled over the image of you having to use up the others, I’m the same way with not wasting anything if I can help it! This is amazing. I have been nightshade free for about a year and have been seriously missing BBQ sauce. I made ribs and honestly could have cried some happy tears it was so good. Just wondering if it’s possible to can it in a pressure cooker? I’ve never bothered to try canning it because it lasts for a reeeaaally long time in the fridge. The amount of vinegar and natural sugars in it mean that I’ve actually never seen it go bad. I’m so glad you enjoyed it!